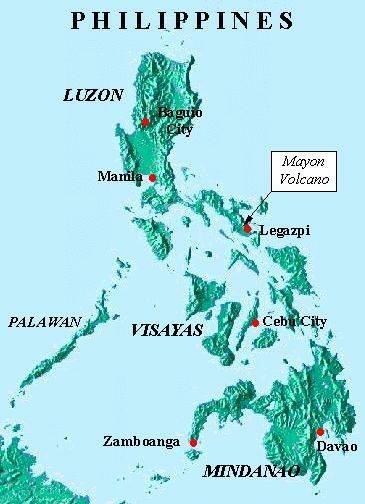 Mayon Volcano reaches 2,460 meters and is the central feature of the Albay Province, of which Legazpi City is the capital, about 300-km southeast of Manila (View Map). It must be one of the most beautiful volcanic cones anywhere in the world and is visible for miles around in the otherwise flat landscape of the region. The volcano is still active and has erupted in 2000 and 2001. There is a research station (PHIVOLCS) located about one-third of the way up that is accessible by road and is the jump-off for climbers. See also Climbing Mayon Volcano and other Bicol Region Tourist Destinations . Here are six photos I took from several locations around the volcano.